This year’s concept collection employs both production and prototype Jeep Performance Parts. Mopar develops and builds the individual parts to match the rigors and challenges of off-road use. Jeep owners often seek these parts and accessories to customize their own ride. In addition to the performance parts, Jeep is using the opportunity to showcase the flexibility of the upcoming Gladiator pickup. The concepts appearing in Moab are directly inspired by the Gladiator. “At the 2019 Easter Jeep Safari, we will be inspiring our customers by showcasing just a fraction of what is currently available in our catalog and also some conceptual accessories that might make it into production in the near future,” added Steve Beahm, Head of Parts and Service (Mopar) and Passenger Car Brands, FCA – North America. Here is an in-depth look at each concept appearing at this year’s Easter Jeep Safari. The Jeep Wayout’s body-armored exterior features a new Gator Green color that will be available on production Gladiator models. Photo: FCA US LLC. Getting to even the remotest destinations won’t be an issue with the Wayout. A Jeep Performance Parts two-inch lift kit increases ground clearance; that’s in addition to the 17-inch steel wheels and 37-inch mud-terrain tires. Two auxiliary fuel tanks (integrated into the bedsides) are complimented by an ARB on-board air system. Add the 12,000-lb. Warn winch, 3.6-liter Pentastar V6 engine, and eight-speed automatic and the Wayout is ready to head out. Jeep says the Motocross culture inspired the vented carbon hood, high-clearance flares, and overall look of the Flatbill. Photo: FCA US LLC. 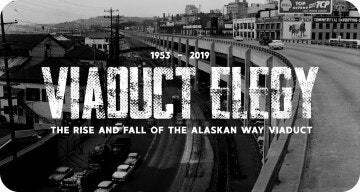 Related: If you’re a Jeep enthusiast, you will love this book. The Flatbill shows the cross pollination between two exciting cultures: the off-road cohorts and the Motocross crowds. This Gladiator-inspired rig is all about transporting those big-boy toys to new locations off the beaten path. The exterior design conveys as much, as do the sliding wheel ramps at the rear for loading bikes. If you’re into Motocross and into the Jeep life, the Flatbill is everything you could ask for. In the interest of canvassing new paths, the Flatbill comes with high-clearance flares, a shorter front bumper, tube-style rear bumper, and a skid plate. What’s more, the Flatbill can flatten any terrain with its Dynatrac Pro-Rock 60 front and rear axles and custom four-inch lift kit from Off-Road Evolution. Larger rear bypass shocks and 20-inch wheels further boost traction and off-road performance. Like the Wayout, the Flatbill features the 3.6-liter Pentastar V6 and an eight-speed automatic. A bonus, however, is the Mopar cold-air intake. The Jeep M-715 Five-Quarter concept will run any trail with its powerful Hemi engine. Photo: FCA US LLC. The term “Five-Quarter” references Jeep trucks of yesteryear, ones that were one-and-one-quarter tons or “five quarters.” This ultimate off-road Resto-Mod combines the look and feel of a 1968 M-715 with the capabilities of the modern-day Gladiator. Those with a historical appreciation for Jeep will likely find a soft spot in their heart for this concept. But for soft terrain this Jeep is not! With a reinforced frame, the M-715 Five-Quarter trades out leaf springs for a heavier-duty link/coil suspension system; the front axle moves forward two inches, being replaced by Dynatrac Pro-rock 60 (front) and Dynatrac Pro-rock 80 (rear) axles. 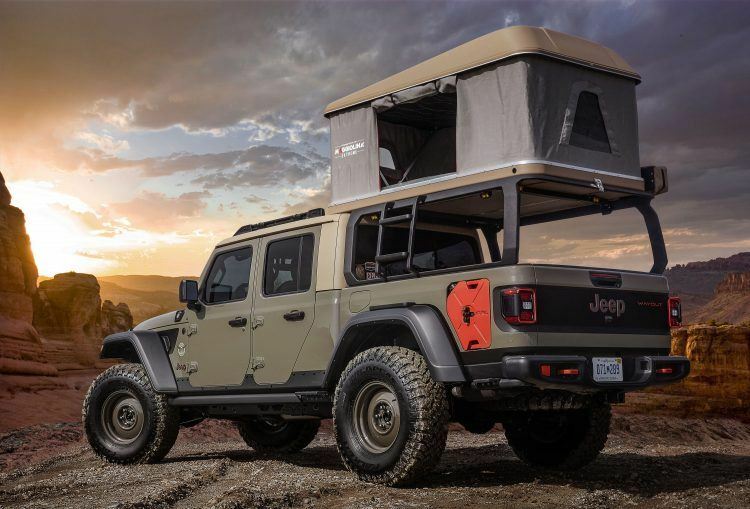 The Five-Quarter receives additional protection from body-length rock rails and modified steel bumpers courtesy of the Jeep Gladiator Rubicon. Those 20-inch beadlock wheels and 40-inch tires don’t hurt either! The original front sheet metal was replaced with a full carbon-fiber front end. Inside, water-jetted aluminum components comprise the instrument and door panels, while the floors are bed-lined for durability. Additional body modifications include a 3.5-inch drop to the convertible soft-top and a six-foot custom-fabricated aluminum bed. Under the hood its a power party, courtesy of a 6.2-liter supercharged HEMI V8 with over 700 horses. A vintage but re-purposed 8-71 supercharger encases the transmission and transfer case shifters. Hitting the trails at night is easy with the HID headlights and LED auxiliary lights. Rearward visibility comes by way of LED halo lights. The Jeep J6 concept comes with a spare tire and a towing package. Photo: FCA US LLC. Related: Taking a walk through Jeep’s dynamic history. The J6 combines the Rubicon’s two-door configuration with the styling of 1970s-era Jeep trucks. For example, the Brilliant Blue paint pays homage to the 1978 Jeep Honcho. 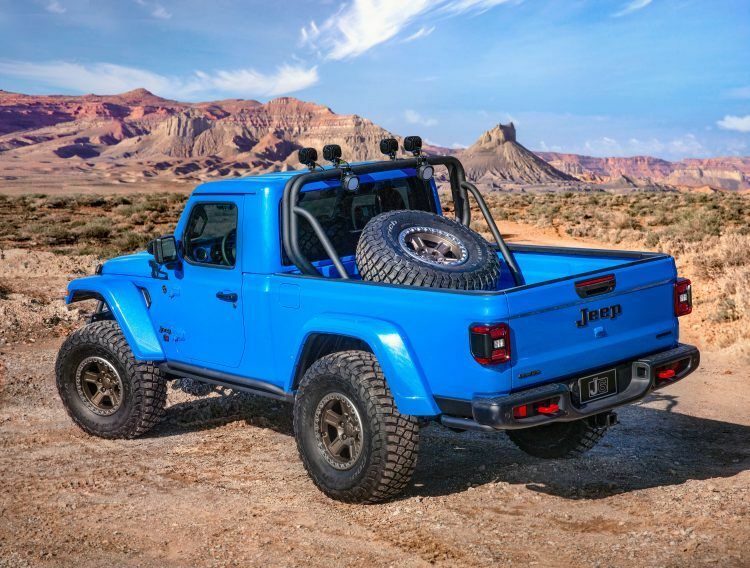 Toss in both prototype and production Jeep Performance Parts; a 3.6-liter engine and a cold-air intake, and the result is a Brilliant Blue concept ready to blaze Moab’s trails. From the get, the J6’s strength is length (201 inches overall). The wheelbase of 118.4 inches matches the current-generation Jeep Wrangler 4-door. The functional box area is 12-inches longer than the standard Gladiator bed to accommodate more cargo. Prototype items in the bed include the body-color spray-in liner; a sturdy, two-and-a-quarter-inch steel sport/roll bar with four, five-inch LED lights shining at 4,800 lumens a pop; and, finally, a spare tire carrier for a 37-inch meat. The J6’s hardtop is removable, by the way. Mopar’s Satin Black grille is a nice touch, as are the hood latches featuring the Jeep logo. On the inside, drivers are treated with blue-accented Katzkin leather seats, a bright pedal kit, and all-weather floor mats. The auxiliary switch bank controls the mounted LED lights, of which there are ten. And if you’re towing a trailer with this J6 concept during the Easter Jeep Safari? Don’t worry because the J6 has a trailer brake controller. The JT Scrambler pays homage to the Jeeps of yesteryear, mainly the CJ8 Scrambler. Photo: FCA US LLC. This Jeep throwback is easily noticeable with those Punk’N Metallic Orange and Nacho body-side stripes. Combined with the white exterior paint and amber top, this Jeep looks right at home in the American southwest. While the colors on the other concepts are definitely sharp, this one takes the cake for us. If we had a Jeep of our own, it would be this color combination. Like the J6, the JT Scrambler pays homage to the Jeeps of yesteryear, mainly the CJ8 Scrambler. This modern-day version follows the Gladiator Rubicon, and employs a treasure trove of Jeep Performance Parts while doing so. Similar to the J6 again, a sport/roll bar accommodates four five-inch LED lights; another two are situated on the A-pillars. Facing forward on the brush guard are a pair of seven-inch LED lights, blasting the trails at 8,000 lumens each. Diffused LED task lights on the sport/roll bar provide visibility for loading cargo at night into the bed, which features eight tie-down points. Katzkin Amaretto Brown leather seats with orange thread adorn the inside. The dash panels and armrest receive the same treatments and, like the J6, the bright pedal kit and all-weather floor mats dress up the interior. The interior should be nice and comfy when canvasing the great outdoors; power comes courtesy of a 3.6-liter engine with a Mopar cold-air intake and cat-back exhaust. Additional Mopar accessories for the Gravity concept include grab handles with the Jeep grille logo. Photo: FCA US LLC. 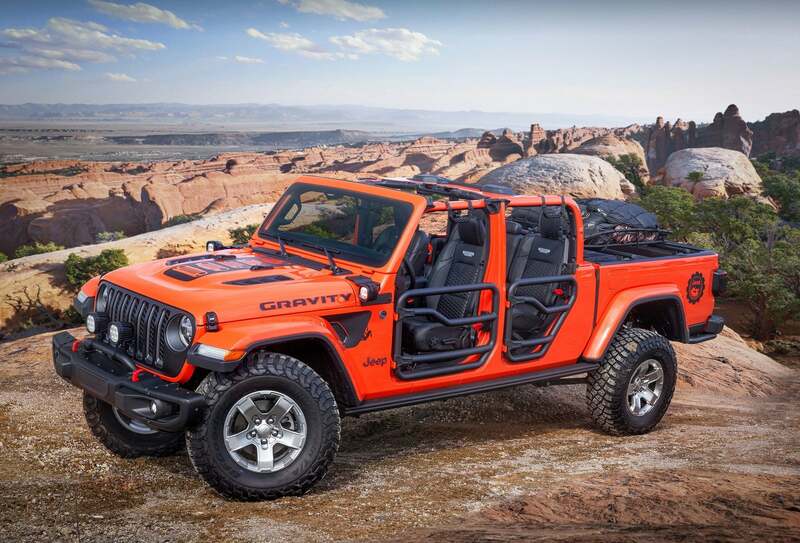 The Jeep Gladiator Gravity concept shows anything is possible with the brand’s Gladiator chassis. While all of the concepts set for the Easter Jeep Safari are awesome, this one really exudes excitement and fun. This is the type of Jeep all your friends pile into for a weekend getaway; and the open-air design makes it all the better. Color is a bonus too: that energetic Punk’N Metallic Orange is more than just a stripe now, but rather the whole banana. In the bed area, Mopar cross rails compliment a cargo carrier basket, perfect for rock-climbing gear. So load up the ropes, carabiners, helmets, and shoes – it’s going to be a fun weekend! The Mopar/Decked truck-bed storage system with dual sliding drawers is perfect for extra gear and equipment (or for snacks and other munchies!). For those more damp excursions, the all-weather floor mats have a “plug” that allow water and debris to easily drain out. To better handle the trails, the Gladiator Gravity rides on a two-inch lift from Jeep Performance Parts. 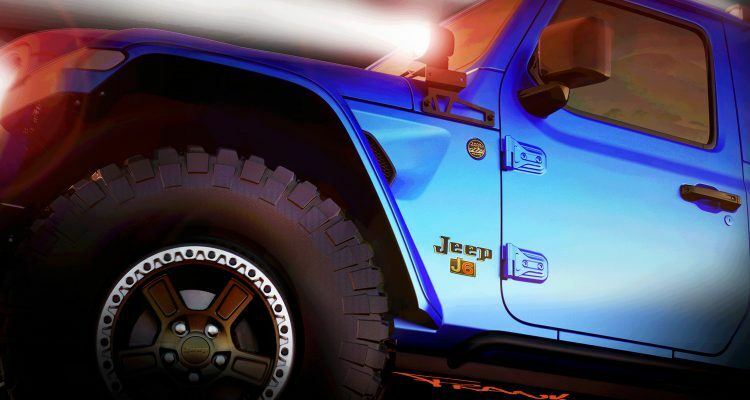 The heavy-duty steel rock rails also come from the Jeep Performance Parts catalog, as do the seven-inch LED lights ahead of the grille and the five-inch LED lights on the A-pillars. Interesting enough, the rock rails have the same powder-coating as Ram bed-liners, making for a non-slip finish. The Katzkin leather seats return, although this time, with Tungsten stitching. And similar to the other concepts, the Gladiator Gravity employs a cold-air intake and cat-back exhaust system to boost horsepower and torque. The 53rd annual Easter Jeep Safari runs April 13th through the 21st in Moab, Utah. Let us know what your favorite Jeep concept is, or if you’re planning on going to the festivities in Moab, do share pictures with us on Twitter. 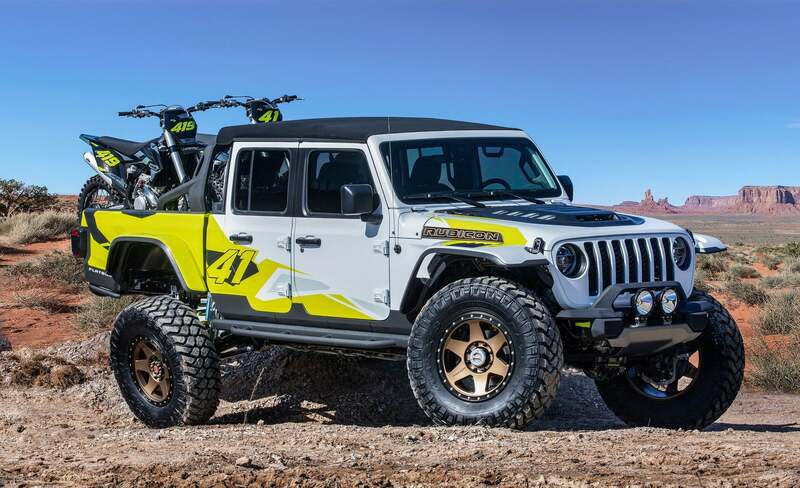 No Comments on "Six Totally Awesome Concepts at the 2019 Easter Jeep Safari"